The much anticipating Aihioma Bridge has finally opened to the commuters and travelling public last Friday, 5th August 2016. Thanks to the National Government through the PSIP funding, the provincial government, the contractors and the locals along the area. Milne Bay Governor, Hon. 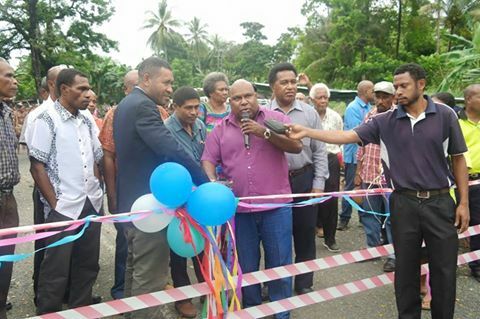 Titus Philemon, Provincial Administrator, Michael Kape and members of the Provincial Assembly and Administration were present to cut the ribbons and officially open the bridge for public use. The bridge will now improve accessibility to the people of North Coast, the villages along the East Cape-Alotau Highway as well as connecting the island people of Esa’Ala, Goodenough and Kiriwina who use the highway to travel up and down. This newly built bridge will now be a relieve to the locals and those who constantly travel and face difficulties especially during heavy rains and floods at the Aihioma cause ways. Speaking at the officially opening was Hon Ricky Morris, president for Huhu LLG and Chairman for Works, Transport and Infrastructure in the Province. He commended the National Government and the Provincial Government through the office of the Governor, the provincial works unit and the people of East Tawala ward for their cooperation in realizing the bridge. Hon Morris also announced that the road sealing project from Aihioma to East Cape will commence later this year or earlier next year and called on the Governor to engage the youths of the areas along the highway in terms of employment opportunities just like how it was done for the construction of the bridge where local youths were engaged. “The Provincial Government under the PSIP funding allocated over one million kina for the construction of this bridge. We are very thankful to the working relations with the locals, the leaders and the provincial and national government for all the cooperation and patience throughout the construction phase of this project that finally completed after almost three years; said Mr. Philemon. Governor Philemon further stated that this bridge is a monument to optimize. It is the ultimate expression of confidence in us, in our communities, the people of Tawala or Huhu Rural Local Level Government and our people from the islands who use this highway to travel up and down. “Today as we are taking a big step forward that brightens our future, I would like to urged the locals and the people of Milne Bay Province to take ownership by looking after and taking good care of the project. This bridge will play a major benefit in boosting tourism and other economic activities in the province.” He said. A contract agreement was also signed by the Governor, Hon. Titus Philemon and Provincial Administrator Michael Kape and Huhu RLLG president and was handed over to the department of works to manage the bridge for future maintenance and up keep. Meanwhile, Governor Philemon also announced that the savings or remaining balance from the construction of this bridge will be used to purchase good water supply system for the locals of Aihioma and Viole villages respectively.